In computer networking and databases, the three-phase commit protocol (3PC) is a distributed algorithm which lets all nodes in a distributed system agree to commit a transaction. 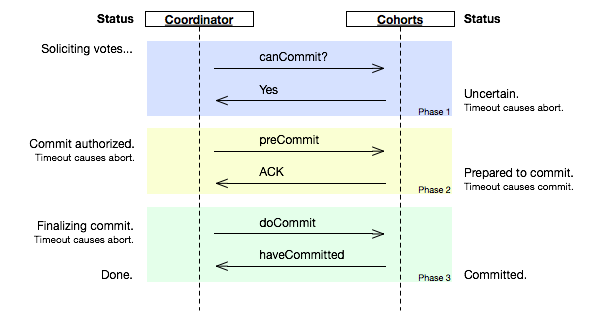 Unlike the two-phase commit protocol (2PC) however, 3PC is non-blocking. Specifically, 3PC places an upper bound on the amount of time required before a transaction either commits oraborts. This property ensures that if a given transaction is attempting to commit via 3PC and holds some resource locks, it will release the locks after the timeout. 3PC was originally described by Dale Skeen and Michael Stonebraker in their paper, “A Formal Model of Crash Recovery in a Distributed System”. In that work, they modeled 2PC as a system of non-deterministic finite state automata and proved that it is not resilient to a random single site failure. The basic observation is that in 2PC, while one site is in the “prepared to commit” state, the other may be in either the “commit” or the “abort” state. From this analysis, they developed 3PC to avoid such states and it is thus resilient to such failures. 在分析 服务器 集群 实现 虚拟网络服务 的相关技术上，LVS集群中实现的三种IP负载均衡技术VS/NAT、VS/TUN、VS/DR的工作原理.